The Staff at St. Wolstan's Community School are beaming with pride at the graduation of one of our past pupils Dairine O’Rourke (pictured above second from the rigth). Dairine was a committeed student who worked very hard when at school and this hard work and commitment has paid off at Trinity College. 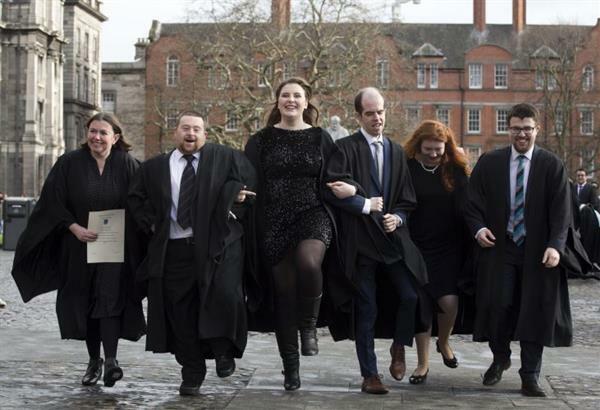 This is the first time that Trinity has conferred a level 5 certification, the first time that a cohort of students with intellectual disability have been conferred at this level by any University and attests to Trinity’s commitment to the values of diversity and inclusion and the vision of a truly diverse campus. Dairine has had huge support throughout her life but her rock of constant support has been her Mother and her Brother. We wish you every happiness and joy at this special time and every good wish for your future. Congratulations from St. Wolstan's Community School.